Here's something that should delight weary airline passengers who had to stand in line at check-in, security, and while waiting to board their airplane. You're going to be able to continue standing until you reach your destination. Who could have seen this one coming when we started paying for food and booze - well except those flying elitists in first-class - headsets, pillows, blankets and what have you? First there's no leg room and now there's no seat room! 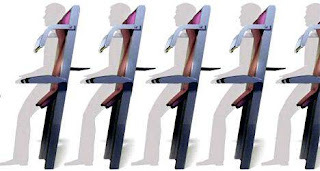 Ryanair in Great Britain wants to introduce a standing area at the back of their 250 planes. The idea is to remove the existing seats and install more rows of so-called "standing seats". Now, I'm sorry. You can't have it both ways. You either sit or you stand. Call it what it is. Standing room only. 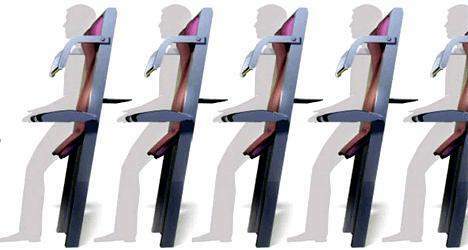 The vertical "seats" would allow a passenger to be strapped in while standing up. Of course, this would replace flying stand-by with flying stand-up! Is that a tray table or are you just happy to see me? Oh, and to add insult to injury, the airline would charge passengers to use the bathroom. There's no window, but you get to take a load off...in a manner of speaking. Thank goodness I don't travel. For as much as I poop and pee (is that TMI?) I'd go broke! And lemme guess: you need quarters to use the loo, eh? Quirks: Just board early and stay in the w/c for the duration of the flight. You get a cheap seat and don't have to embarrass yourself by always running to the w/c. I'm glad I don't fly. I fly rather a lot, and much of it by Ryanair, due to their prices. But I must admit, that those planes of theirs are starting to resemble cattlewagons.... even with the priority boarding. Besides, the prices are getting higher as we speak: they now charge 40 Euros (!!) for a bag that you have checked in YOURSELF. U.R. : Ha, ha...very good. What's next? Deep discount prices for seating outside the plane? Talk about flying on a wing and a prayer! RA: I think it's rather odd and I hope it doesn't catch on. Paying good money to STAND in an airplane? I think it's high time travellers stood up for their rights, in a manner of speaking. Can't see that working. The only comfort I get while flying is sitting in the plane. After standing possibly hours just to board a plane, I'm certainly not going to pay to stand. Unless of course that's standing to pee. Too bad ladies. Don: I think you and I should take a stand on this issue. Your caption would have won a contest. HAhahahaha. As for concept? Screw 'em. KABLOOEY: I'm glad you appreciated it. Thanks for picking up on it. I don't know about you but I don't think this idea is gonna fly. I got to be one of the elitists the last flight I was on. The stars aligned, or something, and I got bumped to first class. I'd never pay for the honor ... but there's something cool about drinking a "free" Heineken, before takeoff, while the rest of the plane loads. This is hard to believe. My assumption is that they can pack the standing seats closer than sitting seats and make more money. Why is always about the money? Cdn Blend: When I was still working I'd fly business class. Like you, I'd never pay for it if I was flying for personal reasons. But, gee, it was nice to be pampered at someone else's expense. Mike: You got it in one! Soon we'll have flying boxcars!